A wild Siberian tiger has been caught on film in north-east China for the first time, a conservation group says. The photograph was taken automatically when the adult cat entered a "camera trap", the New York-based Wildlife Conservation Society said. The night-time shot provides strong evidence that the increasingly rare beasts are beginning to return to long-abandoned hunting grounds, the group said. The photograph shows the tiger gnawing on the carcass of a mule in the Hunchun nature reserve in Jilin province, near the border with Russia. It provided strong evidence that Siberian tigers - also known as Amur tigers - were crossing from Russia to repopulate previous strongholds, the wildlife group said. The "camera trap" was set up after a farmer reported that a predator had killed a mule. 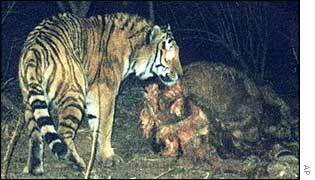 The picture was taken when a tiger returned to the carcass. Dr Endi Zhang of the conservation society said the photo "represents not only the reserve's recent progress, but also a bright beginning for Amur tiger conservation in the future". Tigers have been almost wiped out in China where poachers kill them for use in traditional medicines. The wildlife group - which helped to establish the Hunchun nature reserve - also blamed over-hunting of the tigers' main prey for driving them out of the area. But its scientists said much of the tigers' habitat remained intact and they hoped that tigers would return if hunting laws were enforced. China has a breeding programme for its captive tiger population and hopes to be able to reintroduce them to the wild from their safari park homes.